The FE and Skills Coalition meetings have built on the work of FELTAG and continue to offer both colleges and other sector organisations an excellent opportunity to hear the current issues and challenges which colleges and providers are facing. 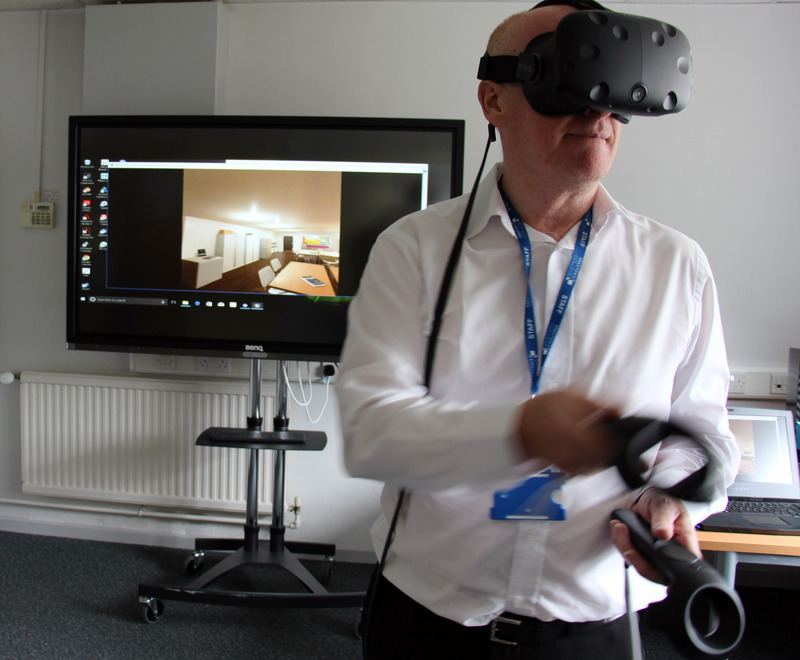 The latter part of this meeting which looked at the role of AR & VR tools in FE & Skills was the subject of an earlier blog post. The meeting heard from Paul McKean, Head of FE & Skills at Jisc about Jisc’s strategic aims in the FE & Skills area, and an overview on Jisc’s current activities in this area. Paul highlighted the sheer pace and extent of change in the post-16 education sector. A plethora of reports, standards and policies over the last few years has given the sector plenty of challenges, and along with area reviews and mergers has meant much upheaval. 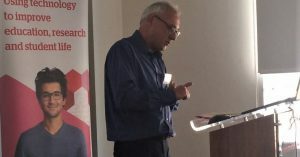 Paul stressed the determination of Jisc to continue to be pro-active in engaging with its members to highlight the benefits of technological solutions and in supporting members in realising those benefits. Student Experience Tracker – The tracker has gathered over 27,000 responses from students since its launch. There are new case studies that demonstrate organisational impact. The Apprenticeship Journey in a Digital Age – This toolkit highlights support and digital approaches for steps along the Degree and higher apprenticeship journey. Currently available as an interactive Powerpoint deck, it will be released as a fully fledged web resource in early 2018. Paul expands on these points in a recent podcast and blog post. 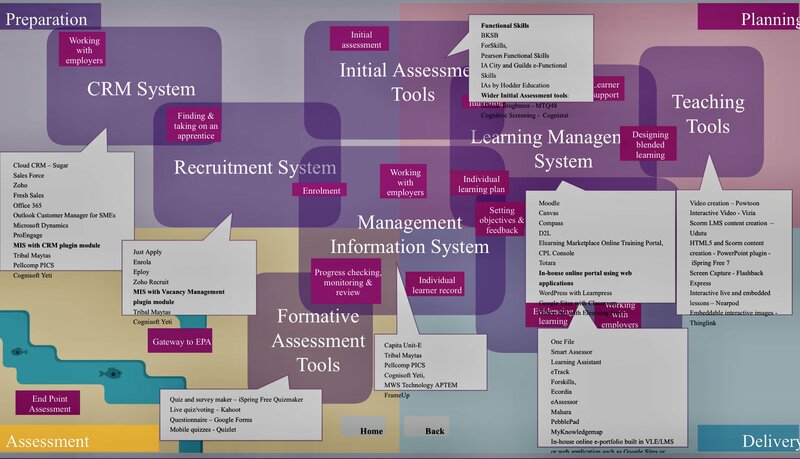 Sarah and Lisa introduced the FE & Skills assessment benchmarking tool as a really useful framework to enable institutions to see where they are in this area and reflect on their practice and on what they need to do to develop further. 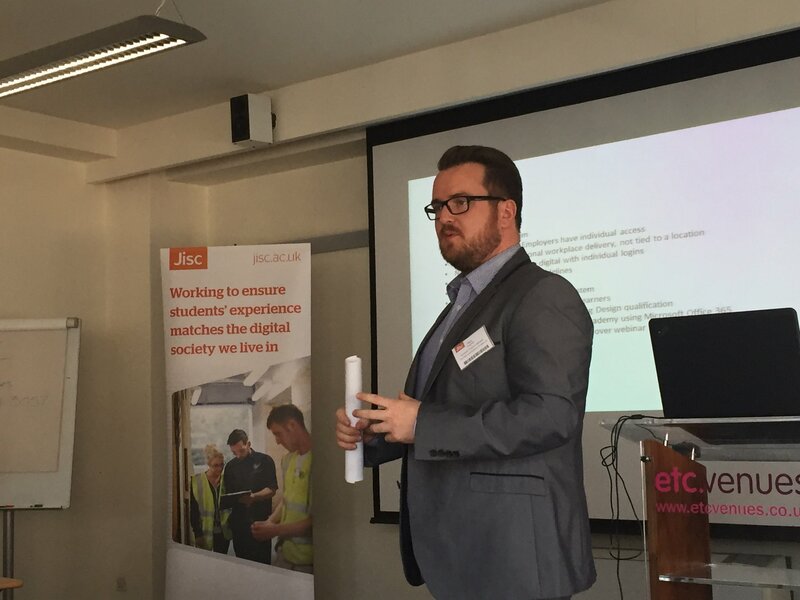 They also drew attention to the Jisc work on employability, where a study of this area has led to the development of a set of guidance materials to help institutions understand the requirements for producing employable students in a digital age. They also touched on Jisc’s work across the learner analytics space, and the really useful insights and metrics that can come from successfully interrogating the huge amount of data that institutions produce these days. Finally Lisa and Sarah stressed the role of students as change agents, and highlighted guidance for institutions in forging effective student-staff partnerships. Ufi achieve this by funding projects that can provide scalable solutions to improve vocational skills. Katherine highlighted two case studies from the Ufi stable (these case studies are free to users). This online, interactive course aims to introduce anyone working in further education, skills or vocational training to the benefits of blended learning and the way that technology can support learners to be better prepared for the workplaces that they will be entering. The course was developed by the University of Leeds and the Institute of Education at University College London. It is available for free, although for a modest £62 it is possible to access more support and ongoing access to the course. iDEA (Duke of York inspiring Digital Enterprise Award) is the digital and enterprise counterpart of the Duke of Edinburgh Award. It is completely free and can be accessed on virtually any device. Anyone of any age can sign up and earn badges to show their achievements in four categories: citizen, worker, maker and entrepreneur. By taking on further challenges, participants can progress to Bronze, Silver and Gold awards. As well as being fun, the badges provide a visual acknowledgement of achievement which can then lead to improved employment prospects in the technology and enterprise sectors. The presentations from this event are available on the Jisc website. There was a really good turn out for the latest in the FE & Skills Coalition series of meeting on the 31st October. There were many issues discussed and debated at the meeting, and some of these will be covered in subsequent blog posts. The focus in the afternoon session was on the role that Augmented and Virtual Reality (AR & VR) tools can play on FE and Skills education and training. Following some hands-on demonstrations from Jisc’s own team who are working with these tools, and from Steve Smith and Frank McHale from Preston College at lunch time, the afternoon session heard from Jisc team, Leeds College of Music and Preston College. There was a lot of interest in the role that these technologies can play in the FE and Skills sector. The ability to give students access to learning experiences that are either expensive, complicated or hazardous makes one case for exploring their use, as does the possibility of constructing learning opportunities that would be physically impossible in the real world. Matt Ramirez, Senior Innovation Developer in Jisc’s Digital Futures directorate opened the proceedings. He ran through some of the history of these tools, and their previous and current place on the Gartner hype cycle, and stressed the changing landscape due to the opportunity arising from the ubiquity of VR and AR capability on smart phones. Both Apple with its ARKit and Google with its ARCore are offering developers ease of access in return for entering their particular walled gardens. Standards that allow easy interoperability in this space are needed to break down these proprietary islands. Jisc is looking at what institutions need to help them get going. Along with advice about how to select particular technologies for evaluation or use in production environments, Jisc is looking at how to help with advice on things like repositories like SketchFab. Read Matt’s blog post which covers other interesting applications of these approaches to medicine, archeology and technical education. Martin Hamilton is Jisc’s Futurist, and he has written about Apple’s ARKIt, highlighting the way that it is mainstreaming augmented reality. Some colleges are already embracing AR and VR approaches. Steve Smith and Frank McHale form Preston College’s Preston’s College‘s Learning Lab confessed themselves near the start of their journey, and described their initial explorations and paid generous tribute to Matt Ramirez for his help in making some initial good choices in terms of technologies to investigate without spending a fortune and ending up with an expensive white elephant. Steve and Frank stressed that while the potential of AR & VR tools is immense, their early experiences of talking to vendors was not encouraging. Their recommendation was to avoid the hard sell from the vendors with their ecosystems and explore ‘consumer’ level hardware and explore what can be done with these tools. They both stated that exploring the affordances of these tools had revitalised their interest and excitement in their role as teachers . Leeds College of Music told us that they were further down the track in terms of implementing and making effective use of these approaches. Being a specialist music college, they have a requirement to teach students to be effective in the studio as well as as performers. 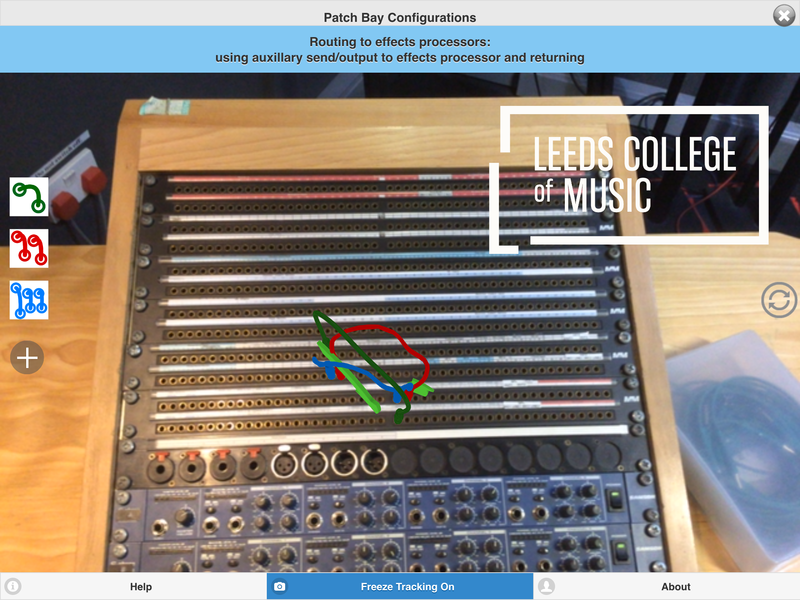 They have created an AR resource that helps students get experience of setting up the patch bay (where audio signals are routed to sound processing modules and onwards). Students found this approach really useful, as it gave them the opportunity to fully interact with the patch bay and work things out for themselves. Note – this was captured via an iPhone with no external microphone. Presentations from this session are available on the Jisc Website. 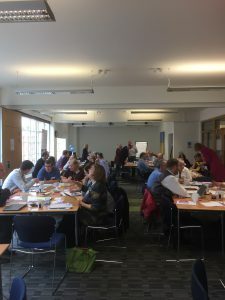 On the 10th May over 50 representatives from further education and skills across the UK attended the Jisc hosted FE and Skills coalition meeting in London. The theme of the meeting was the apprenticeship journey in a digital age. The aims of the meeting were to explore how we can embed technology throughout apprenticeship design, delivery and assessment and to hear from participants on their experiences of using technology in support of apprenticeships. With apprenticeships going through a period of great change with government targets to deliver 3 million new starts by 2020, and a move from provider-led frameworks to the delivery of new employer-led standards. Many providers are now seeing technology as core to their delivery model if they are to be cost-effective. We heard from Joe Wilson, @joecar, on his views around the current apprenticeship landscape and the challenges facing colleges and providers with the anticipated changes. Lisa Gray updated the group on the work Jisc has been conducting in relation to how technology can support the design, delivery and assessment of apprenticeships. Jisc is developing guidance to providers moving to these new models of delivery, and Lisa provided an overview of work to date. The guidance available is based on a roadmap of effective practice from the preparatory stages through delivery of training to end-point assessment and highlights the key role of technology throughout. You can view Lisa’s slides here. Read Lisa’s blog post about the project and you can access the apprenticeship toolkit here. We would welcome your views and feedback on this resource through our feedback form. Please contact Lisa Gray (lisa.gray@jisc.ac.uk) for more information. You can view the Periscope recordings of these presentations here. The Education and Training Foundation have a programme of support for providers and colleges delivering apprenticeships and Alison Morris and Dawn Buzzard presented to the group on what support and training opportunities are available. You can access their slides here. To end the day Rob Bristow and Sarah Dunne ran an activity on developing user stories to capture user requirements, to feed into the developments on the Jisc digital apprenticeship work. You can view the user stories here. The meeting ended with a plenary panel where each member of the panel was asked to share their key take away message from the day. This included the importance of developing a digital vision, supporting staff with the development of their digital skills and capabilities, realising the value and benefits digital can offer. You can view the Periscope recording of the panel here. Co-authored by Martin Hall and members of the Manchester College Analytics Lab team. Colleges across the UK are facing-ever more complex demands to make their case for funding, and other forms of report. At the same time, government policies both here, and across Europe and North America, acknowledge the need for a new deal for building technical education, training and the skills that are essential for re-securing economic growth. How can the huge and diverse sources of data that are now available be better used to address and inform key policy decisions, in ways that meet both the requirements of national and regional agencies and also the local nuances and concerns of colleges serving immediate communities? We explored two separate areas of need. How can information about the content of FE programmes be made accessible, in a meaningful way, to both learners and employers? How can we describe the relationship between college programmes, the attainment of competencies and formal qualifications more accurately? What do you do, as a college leader, when you need to be part of the city region plan for accelerating apprenticeship starts, but you have a severe shortage of local firms for absorption? How do you reconcile the dependency of learners on campus proximity and affordable transport routes with the rationalisation of provision across the city region? To answer these questions we used internal college data and, crucially, we were able to “superimpose” detailed employment and other local data shared by GMCC and the New Economy. We know that employers value the practical, competence based aspects of a qualification when recruiting. For some qualifications, such as NVQ, the competence element is clear. However other qualifications often also include significant competence based elements which are difficult to communicate and, because of the sheer number available, are not well understood by employers. We used college data on module content of qualifications and combined it with detailed data gathered by the college on what percentage of each module was competency based. The visualisation below clearly highlights which courses have more competency element than others as well as showing that a simplistic approach does not give an accurate indication of the competence element of courses. This allows employers to readily identify relevant courses and learners to make informed choices. Heatmap showing employer locations in the area. Students’ home locations can be superimposed. “As a prospective apprentice, when applying for a job / college place, I want to ensure that I am able to travel from home to the location in a reasonable time frame”. This pilot has demonstrated that by combining college internal data with local and national data sets it is possible to create compelling visualisations that enable data informed decision making relating to the construction sector. By clearly showing the competence element of courses offered by the college employers are better able to identify which courses they should favour, and learners are better able to choose course to enroll on. 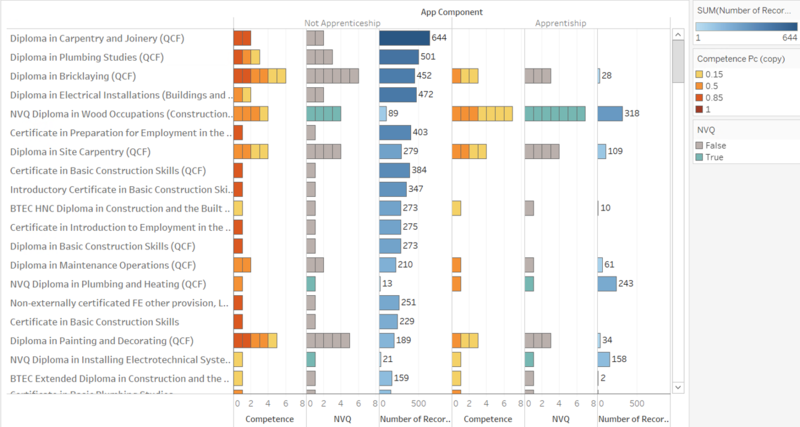 By overlaying national employer data and local project data the data dashboards can make it easier for colleges to find appropriate apprenticeship partners that aren’t necessarily locally based. By highlighting challenges that learners face, such as transport, local area planning can be better informed. 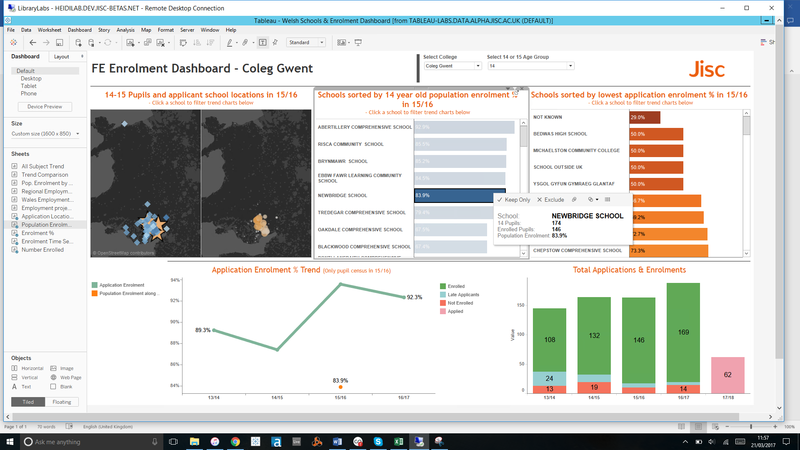 The College Analytics Lab enables a wide range of organisations who need to work together to do so meaningfully through secure sharing of data, with dashboards that promote a shared understanding of complex issues. When a group of colleges form a strategic partnership, they typically work together to share resources, expertise and a collaborative approach to planning. Could sharing data help the partnership to become more effective? For example, could sharing information about applications, enrollments, outcomes and destinations help the colleges to work together to provide a more structured, joined-up offer to young people in the area to secure economic development of the region? 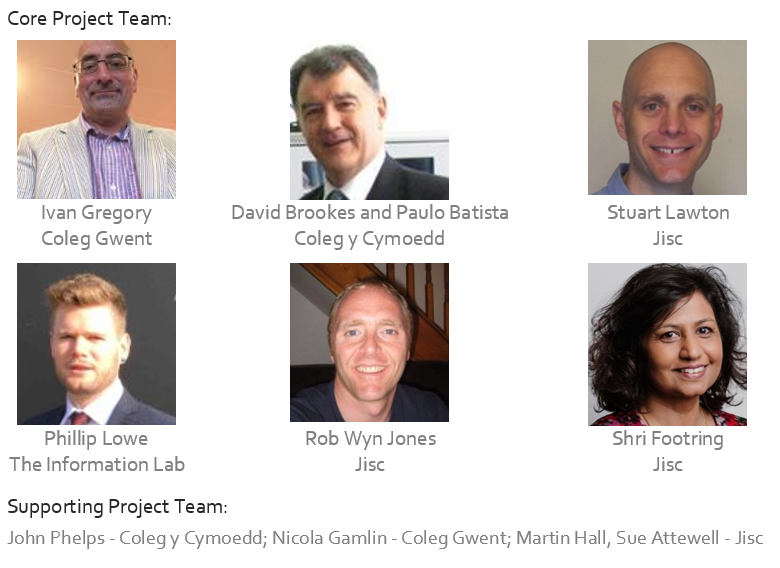 This post is co-authored by members of a forward-looking partnership from South East Wales who set out to explore just that, working as part of the Jisc College Analytics Lab project. This short, three-month pilot project started with a face-to-face workshop to establish which business questions and data sources we would explore first. Business requirements were expressed as user stories. Following agile principles, we then worked in time-bound ‘sprints’, with regular online meetings to review and reflect on progress and adjust project priorities if required. As a director of learner services and support, when monitoring application and recruitment for 2017 / 18, I want to target recruitment activity so that I can increase participation / recruitment and understand conversion rates by geographical area and subject type. We broke the high level user story down into manageable chunks to work on each month, summarised below. Which schools are we receiving applications from? What are the pupil numbers at those schools and how many are applying? 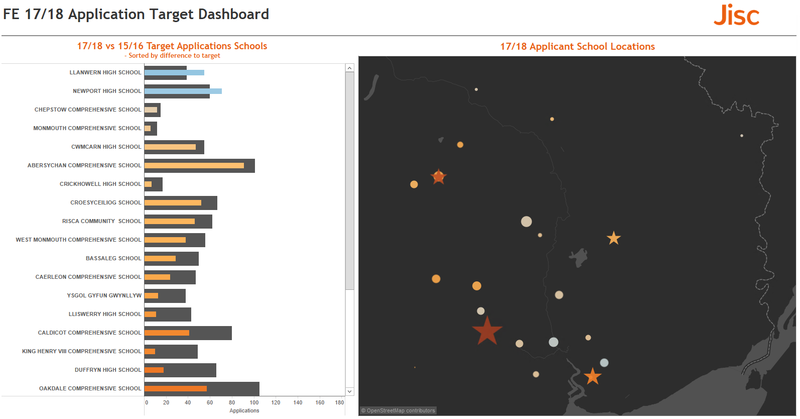 “Creating a visual representation of the geographic distribution of source schools to the colleges required some advanced data blending techniques. 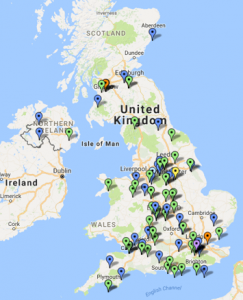 The data provided by colleges highlighted which schools learners came from, however the location of these schools wasn’t included. Another piece of useful information was the total number of pupils at each school by age group. The difficulty here was that to join each of these data sets together the school name needed to be an exact match, however only 30% of the school names were an exact match. Fuzzy matching is a more advanced way to match data sets as it looks at individual words and can match based on different criteria (e.g. the phonetic sound of each word of each word). 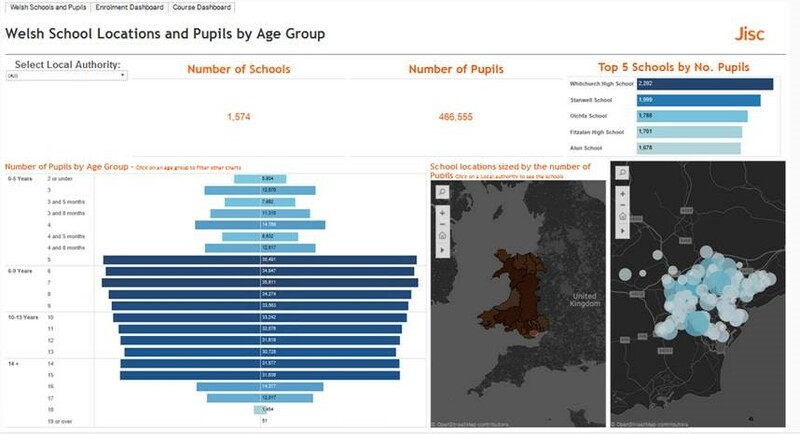 This fuzzy matching approach improved the matched schools to roughly 85% and enabled the joining of both location data and pupil census data to the collages application data.” – Phillip Lowe, Tableau and Alteryx consultant, The Information Lab. How are enrolled learners distributed across different subject areas? Is there a particular subject area that seems more popular in one college vs. others? Are there some schools in which there are more learners going to one college over another? 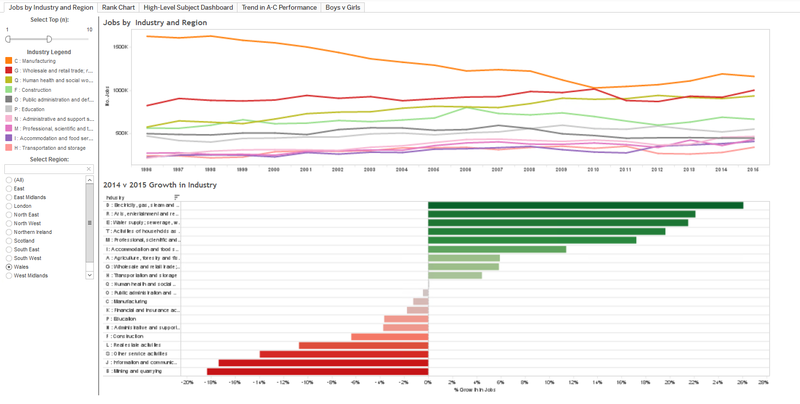 What are the trends in course popularity? Can we predict enrolment trends? Can we identify areas where recruitment trends from specific schools are increasing? 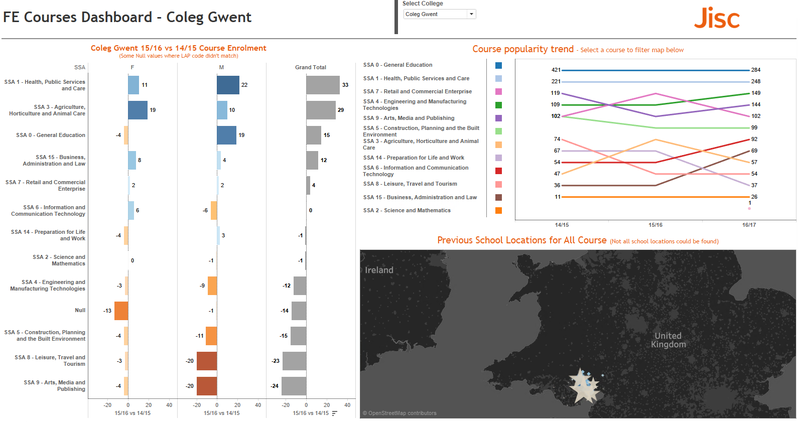 Can we understand enrolment trends by course? How are applications from certain schools comparing to last year’s applications? Further Education Colleges are adept at dealing with change and challenge. They have to be. Identifying, evaluating and capitalising on opportunities which arise in the rapidly changing environment we work in is a core skill of all successful college leaders. Recent conversations with college principals have shown that meeting local employers’ needs; improving student experience and outcomes; helping to bridge the skills gap; and serving the local population, particularly school leavers, are all high on their list of priorities. Alongside the economic, political and regulatory challenges faced by colleges, there have been other significant technological and data developments which can help us to address them. For example, high quality, detailed data sources (both open and securely held) are now more accessible than ever before. The tools to process, link and visualise these data sets are becoming more sophisticated and easier to use all the time. We know that using accurate local area data to inform strategic planning and decision making is crucial to success. Presenting the information in a visual and interactive way helps leaders to communicate their vision and ideas to their funders, staff teams, students and the wider community. However, what we have found is that there is a wide variation in the effectiveness of the way in which colleges make use of the data available to them. We also found significant duplication of similar core processes across colleges. How can the FE and Skills community benefit from the availability of new data sources and state-of-the-art data visualisation technologies? Jisc’s well-established Analytics Lab environment provides a secure technical, legal and project management framework to enable the creation of new, experimental data dashboards. As part of the Jisc HESA Business Intelligence project, participants use a mix of open and secure data from both new and established sources, to create visualisations and dashboards which address key business questions. In January, we extended this project to include the FE and Skill sector, working with two groups of colleges – one from South East Wales and the other from the Greater Manchester City Region. This pilot project used our unique specialist Analytics Lab development environment, making a few adjustments to meet specific FE needs, and was underpinned by our knowledge of the Jisc Learning Analytics data definitions and architecture. More details about the two pilot projects will appear in future blog posts. A secure, remote desktop environment which contains state-of-the art data visualisation tools including Tableau and Alteryx. The secure environment is used to house a wealth of data collected from a variety of sources, cleaned and in a format that is ready to use. Carefully agreed and signed legal agreements enable colleges to use sensitive data securely, as needed. The most important element. Teams are made up of sector experts (who understand the important business questions facing them and what data will help them to find the answers); consultants who are able to transform and link data to create powerful interactive visualisations and dashboards; and Jisc staff who provide agile project management. Teams of sector experts work together on a focused 3-month project. At the start of the project they work together to identify and prioritise their most pressing business questions. They then consider which data sources would help them address these. Typically, these are a mix of internal, external, public, private, existing and new data sources. The next step is to work with specialist data analysts and a Jisc project manager to explore identified data sources which, when combined, can help to answer their business questions. It is a “lab” process, so is experimental by definition. It may or may not lead to the creation of dashboards which are generically useful to the sector, but they will certainly be useful for the participants. 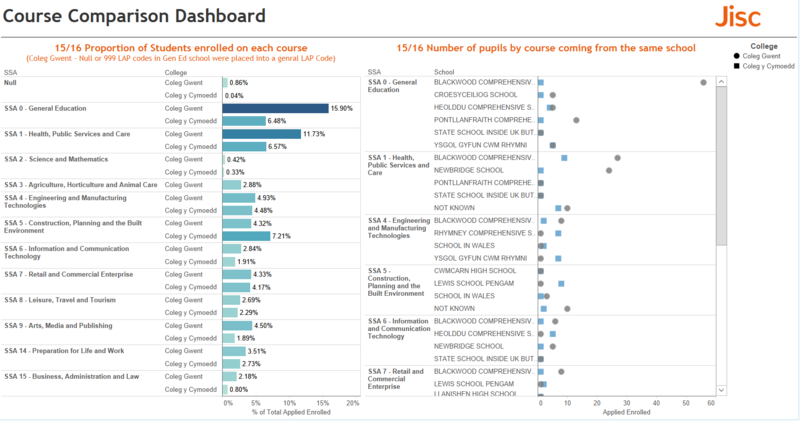 Data sets from participating FE Colleges are analysed alongside other data from a variety of other external sources to produce visualisations and dashboards which can be used by a wide range of college staff enabling data-informed planning, benchmarking and strategic decision making. A few years ago, interrogating data was an expensive, specialist skill limited to a few within a typical FE college. Static reports would have been used by senior managers at specific times during the planning and evaluation cycle. We hope the Analytics Lab environment will help open up the field of data science and bring it within the reach of all who have an interest in the college. In addition to the senior management teams, this could include subject / curriculum leads, support staff, Local Enterprise Partnerships, students, parents, governors and the wider community. We have the facility to bring new open data sources (such as local transport routes) into the environment and build up a comprehensive catalogue to improve the use of data in the sector as a whole. Understanding underlying data trends and using the information for planning has the potential to improve the data literacy of all involved. The Jisc Business Intelligence projects have enabled a wide range of HE professionals to engage critically with data in powerful ways to address key business questions facing them. I believe the same can be achieved in the FE and Skills sector, where this model will enable many more people to use data to inform strategic decision making. This guest post is by Ros Smith, author of the updated Evolution of FELTAG guide. Over the last few months, I had the privilege to ‘talk FELTAG’ with some leading senior managers and practitioners in further education (FE). Why? It was time to take a fresh look at the impact of the FELTAG recommendations on the sector before updating our Evolution of FELTAG report. The report provides an important insight into the digital landscape of the UK FE and skills sector. And this latest glimpse reveals a sector that is agile and robust, and more than capable of responding to the very tough challenges it faces with its own blend of visionary thinking and hard-nosed astuteness. The good news is that the spirit of FELTAG is very much alive and well, and in a college near you! Here are some of the key findings from our 2017 FELTAG update. Many organisations are addressing their FELTAG goals by drawing up a digital strategy. This in itself recognises the importance of technology in the sector. However, things are never as simple as they sound. The first issue you have to confront is the connection between your organisation’s digital aspirations and its other strategic aims. Interconnectedness is key. There is no value, after all, in procuring a new VLE or learning management system without a programme of staff development to ensure the technology is used to its full potential. Nor is there any point in having a strategy for innovative curriculum delivery without first having the right tools in place. “It’s like an eco-system or a fine Swiss watch. Each cog is important individually but even more important is how it links into the others…. To achieve these goals, we have been on a three-year journey.” Dr Ken Thomson, principal and chief executive, Forth Valley College. Cornwall College Group took an altogether different tack, keeping Moodle as its cross-campus VLE but ensuring that users’ needs were met by altering the look and feel of the VLE. Their case study describes how Moodle can be adapted to enhance its functionality and refresh its appeal. “I said to staff two years ago when we started the drive for creative learning and teaching that I was taking the responsibility for what happened. This meant they were free to experiment without blame.” Ken Thomson, chief executive, Forth Valley College. Where are you on the digital scale? The titles of digital strategies now more frequently feature creativity and innovation rather than technology. A small thing in itself, but could it indicate technology is no longer seen as the new kid on the block? The real benefit of digital technology has always been its capacity to transform the way things are done for the better, and that is what the strategies of many organisations across the sector are now aiming for. Join speakers from PROCAT, the Hull Group, Forth Valley College and Portsmouth College at our sessions at Digifest on 14-15 March and follow #feltag to follow discussions. We were delighted to welcome 50 representatives from further education, skills and adult learning providers to the Jisc hosted FE and Skills Coalition meeting held on 20 October in London. This was the second meeting of this group which has been established to support providers with working towards the recommendations of FELTAG. The group plays an essential role in facilitating the sharing of best practice on how providers are using technology to enhance teaching, learning and assessment. The group has representatives from the coalition partners including ETF, AELP, ALT, Ufi and the Institute for Learning and Work. The focus of this Jisc hosted meeting was to discuss how technology can enhance assessment and feedback practices and processes. 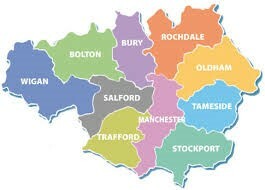 An area previously highlighted as one of the challenges providers face. The meeting also provided us with the opportunity of consulting on new resources to support providers make the best use of technology-enhanced assessment and feedback. You can view the Storify of the Tweets from the meeting here. 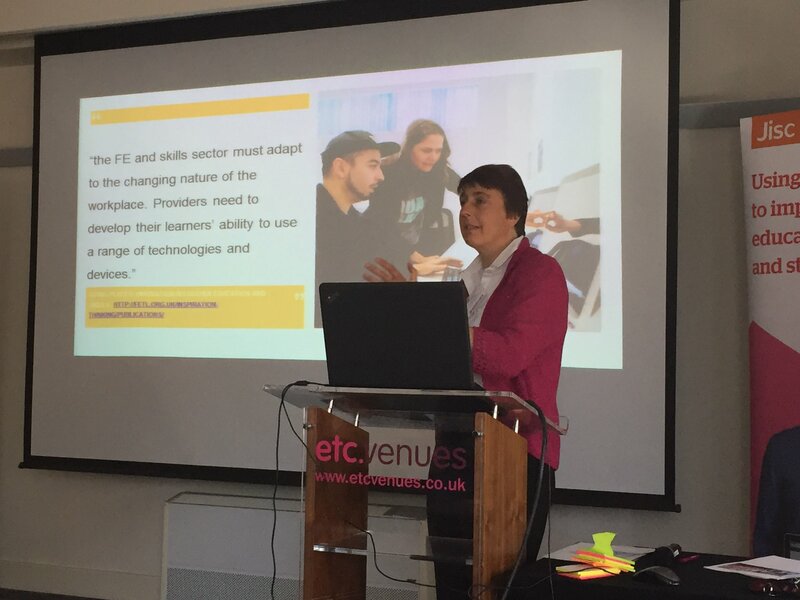 After an initial introduction to work Jisc is conducting to support learners’ digital experiences from Sarah Knight, who chaired the meeting, we had an overview of Jisc activities for supporting FE and Skills with assessment and feedback from Lisa Gray, Senior co-design manager. You can view Lisa’s slides here and view the Periscope recording here. Participants provided valuable feedback on the Jisc Draft Benchmarking Tool for FE and Skills on Technology Enhanced Assessment. This benchmarking tool is the latest in a series of resources Jisc has produced to help learning providers improve their learner experience and enhance their assessment and feedback practice. It is aimed specifically at learning providers in the FE and skills sector. You can view the draft tool and guidance here. Based on the feedback we received at this meeting, we are working on a revised version for release in early 2017. Jayne Holt, Assistant Principal, Learning Services, Walsall College, presented her college’s innovative work on online assessment and the student journey. You can view Jayne’s slides here and access the Periscope recording here. 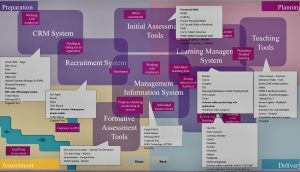 The case study outlining their approach to electronic management of assessment can be accessed here. Rachel Challen, e-Learning Manager at Loughborough College, presented on how technology is integral in supporting the delivery of learning and assessment at Loughborough College. You can view Rachel’s slides here and the link to the Periscope recoding here. You can read a case study of Badges mean progress in English GCSE from Loughborough College here. 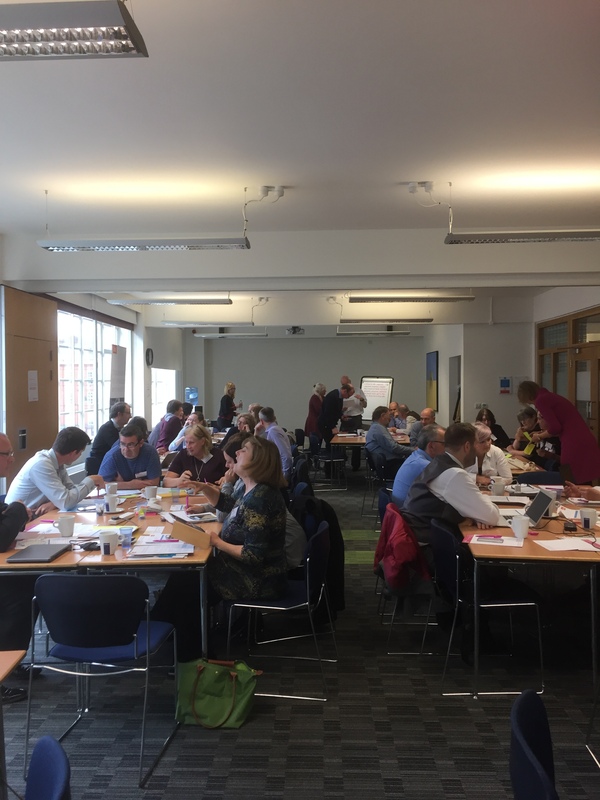 Through discussions participants highlighted the current challenges they face with using technology to support assessment and feedback, and in particular the new apprenticeship model. Issues such as culture change, integration of systems and supporting staff in developing appropriate curriculum design skills to support the development of new curricula and formative assessment activities, were discussed. Apprenticeships is a growth area in FE and Skills and through the area review process providers have been challenged to increase their delivery of apprenticeships. With a government target of 3m starts by 2020 and a history of just over 2.2m apprenticeship starts over the five academic years from 2009/10 to 2013/14 this represents a huge increase. Only through the effective use of technology, can this target be delivered. So Jisc is undertaking some exploratory work to inform the development and delivery of the new apprenticeship qualifications, focused on supporting decision making around the most effective use of technology. The focus is on articulating an ‘ideal state’ where technology is used to best effect to maximise the benefits technology can offer, both in terms of cost-efficiencies and learning enhancements. The audience for this work is those involved in the development and delivery of the new apprenticeship standards. We will be working with the Institute for Apprenticeships, AELP, FE colleges, skills providers, employers and awarding organisations to take this forward. If you would like to join a working group to feed into the development of this project, please contact Lisa Gray. We would like to thank all who participated in this meeting and we look forward to further meetings in 2017 – dates to be announced. We’ve produced a report, which you may find useful, as part of the groundwork for the Cloud services for FE project. This once rejoiced under the name of “Jisc in a box” and also “Shared Services for MI R&D”, if you’re thinking that you haven’t heard of it before. The report provides a picture of which student management, finance and HR systems are in use in England. It also uses previous information from Scotland, Northern Ireland and Wales to provide a picture of use across the UK. The project aims to provide colleges with an easy, cost-effective method of procuring MI systems on a “Software as a service” (SaaS) basis. We needed to understand what systems are currently in use across in order to determine which systems should be included within the scope of the project. We had reasonable data for all parts of the UK except for England, where about 90% of existing colleges are located. Jisc commissioned external consultants from Hapsis Ltd. to obtain the information. Hapsis used Jiscmail lists to email contacts within English FE colleges, asking them what systems they were using, how well they integrated together and how satisfied they were with the suppliers. 88 colleges responded – 26% of the current total of colleges in England, which should provide us with a very representative sample. A small number of suppliers, typically 4, provide around three quarters of the systems, but these suppliers differed across the functions. The four main suppliers of student management systems are: Capita, Tribal, Compass and Civica. MidlandHR’s iTrent system is the dominant HR system in use with a market share of one-third. Satisfaction varied across respondents, with Ffnance systems showing the least dissatisfaction but more neutral responses. In contrast, satisfaction was more polarised for student record systems. Ease of access for finance and HR systems, plus security and reliability of HR and student records were amongst the highest scores. Ease of implementation was identified as an issue, particularly for HR systems, and supplier relationships and value for money in both HR and student records scored the lowest ratings. The high response and willingness to engage demonstrates the interest from the sector in this project.